I got some great news from a client. A video sales letter (VSL) I wrote for them is making over 300 sales a day. The product is a health-related ebook plus there’s an upsell. I won’t go into the details but that’s a chunk of change in that client’s bank account every day. In full disclosure, the client is great with traffic and testing. They’re a full-on direct response company and it shows. I tweaked the copy several times based on some testing data and, after a lot of hard graft, the VSL is rocking. I don’t know the conversion rate but 300 sales a day is … 300 sales a day plus an upsell that converts at around 25%. Good news for the client and this direct response copywriter. Personally, I don’t like the VSL when I’m buying something but that’s just me. In many verticals, the VSL works. But in others, it’s a total fail. But here’s the important point. The client showed the copy to another copywriter who they hired to critique the work of other copywriters. The “other” copywriter panned the copy. I stuck with my guns and the client let me do that … with a few minor changes. I can’t wait to see that consultant and tell them about the 300 sales-a-day result. When it comes to copy, it doesn’t matter what I think. And it doesn’t matter what someone else thinks. The only person who matters is the potential customer. Will they buy? Or will they not buy? I’ve written direct response copy that’s failed. But I’ve also written copy that’s worked astonishingly well. 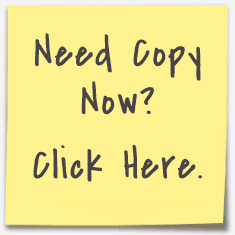 The “copy police” might have found the former copy wonderful but the latter copy laughable. My approach? I always follow the proven fundamentals of direct response copywriting. That’s the starting point. This means research, finding out what’s worked before, and then patient testing. A lot of copywriters now spend their time training other copywriters. And that’s fine. But that gig isn’t for me, although I have a series of “look over my shoulder” copywriting videos as part of my client-finding service you can discover here.